DOVER, NJ, MARCH 23, 2011 — Dynamic. Striking. Versatile. The EDIFICE Black Label Collection, from Casio, redefines these words with the introduction of three new models; the EFX530P-1AV, EF550PB-1AV and EF527BK-1AV. These models reflect a distinct sense of style by providing men with features that are ideal for professional and weekend lifestyles. The collection speaks to upwardly, mobile men whose goals lie anywhere from the boardroom to the ballpark. With three aristocratic, sleek styles, the Black Label additions possess features including multi-layered dials, world time, daily alarms and more. Made with strong, comfortable band materials of resin and stainless steel, each style exudes an attractive, sophisticated look with black IP case coloring. Each model possesses its own exclusive features that set it apart from the rest. The EFX530P-1AV features a stacked sapphire crystal dial, where sub-dials are arranged three dimensionally on the face. An additional, smaller hour hand is utilized for dual time, which can be layered below the larger hour (home time hand) when not in use. Furthermore, the EFX530P-1AV has 3-D modeling for its side buttons and an engraved brand logo on the crown that adds a quality impression. Styled with an engine motif, the EF550PB-1AV is equipped with stacked sub-dials, which are strategically covered for enhanced legibility and a dynamic look. The sub-dial at the 3 O’clock position is designed to resemble a racing wheel. Armed with a 1/20th second retrograde chronograph, the EF550PB-1AV’s second hand alternates between clockwise and counter-clockwise motion during timed measurements. 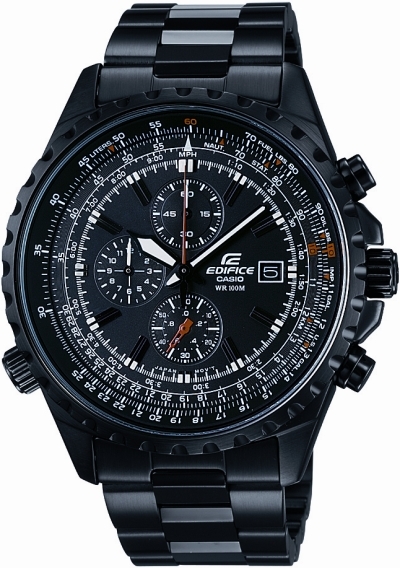 The EF527BK-1AV possesses a 1/20th Second (12 hour) chronograph, a double-lock, 1-press, 3-fold buckle and an inner rotating slide rule bezel. Reminiscent of pilot watches, the EF527BK-1AV’s slide rule bezel allows simple arithmetic conversions and other calculations such as time-distance. All EDIFICE models will be available this spring at Tourneau, Nordstrom and select Macy’s and fine jewelers. Casio’s EFX530P-1AV can be purchased for an MSPR of $380 and the EF550PB-1AV and EF527BK-1AV can be purchased for $250. 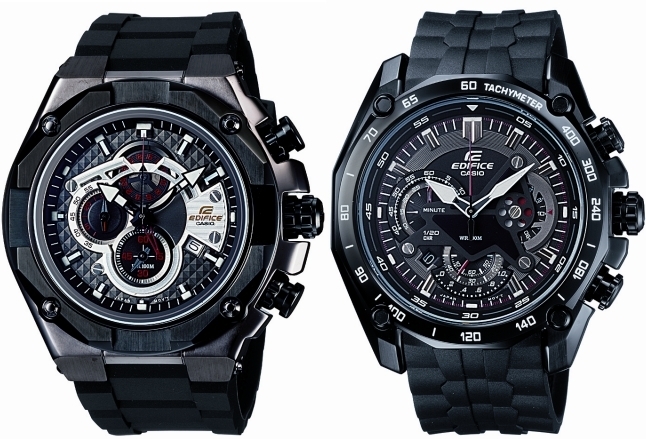 For more information on the EDIFICE Black Label Collection, visit www.edifice.casio.com.